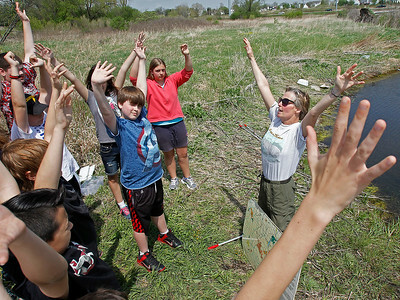 Matthew Apgar - mapgar@shawmedia.com Educator Leslie Krebs, right, instructs students to raise their hands with an exercise teaching the importance of soil and water conservation during the McHenry County Schools Youth Groundwater Festival on Thursday, May 07, 2015 at the Kishwaukee Headwaters Conservation area in Woodstock. Matthew Apgar - mapgar@shawmedia.com Connor Burns, left, and Raphael Wong, both 13 and from Huntley, learn the importance of soil and water conservation as they search a fishing net for living organisms during the McHenry County Schools Youth Groundwater Festival on Thursday, May 07, 2015 at the Kishwaukee Headwaters Conservation area in Woodstock. 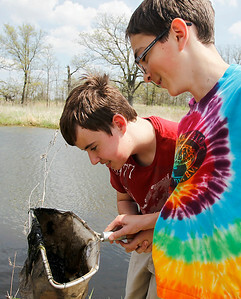 Matthew Apgar - mapgar@shawmedia.com Joey Reisenbuchler of Huntley, 13, looks for living organisms within a net used to scoop contents from a small body of water a the Kishwaukee Headwaters Conservation area during the McHenry County Schools Youth Groundwater Festival on Thursday, May 07, 2015 in Woodstock. 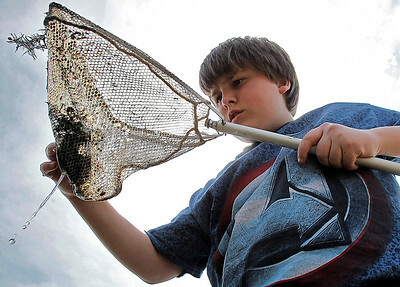 Joey Reisenbuchler of Huntley, 13, looks for living organisms within a net used to scoop contents from a small body of water a the Kishwaukee Headwaters Conservation area during the McHenry County Schools Youth Groundwater Festival on Thursday, May 07, 2015 in Woodstock.